Tens of thousands of sea turtles are caught each year by small-scale fishers off South America's Pacific coast, new research shows. 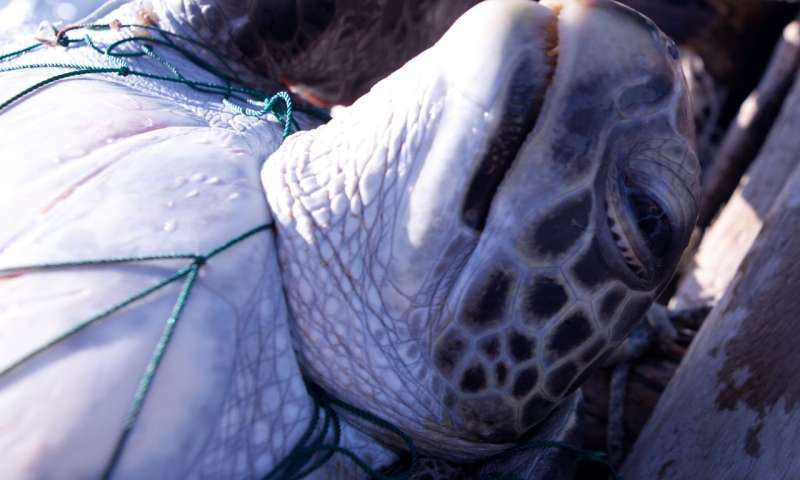 Surveys at 43 harbours in Ecuador, Peru and Chile reveal that gillnet fisheries catch more than 46,000 sea turtles per year, with more than 16,000 killed in the process. And the true numbers are likely to be higher, as not all ports in each country were surveyed. Such accidental catching—known as bycatch—is a major threat to species including sea turtles, and the researchers say their findings highlight Ecuador and Peru as key places to tackle this. "People worry about industrial fisheries but a real concern that people are waking up to is small-scale fisheries," said Professor Brendan Godley, of the Centre for Ecology and Conservation on the University of Exeter's Penryn Campus in Cornwall. "These are small vessels but they exist in such huge numbers that they can have a massive impact on ecosystems." Turtles living in the study area include leatherbacks (critically endangered in the east Pacific) and hawksbills (critically endangered worldwide). Dr. Joanna Alfaro, who obtained her Ph.D. at Exeter and is now director of ProDelphinus, a conservation organisation in Peru, said: "This work highlights the importance and the benefits of our approach of engaging with fishers. 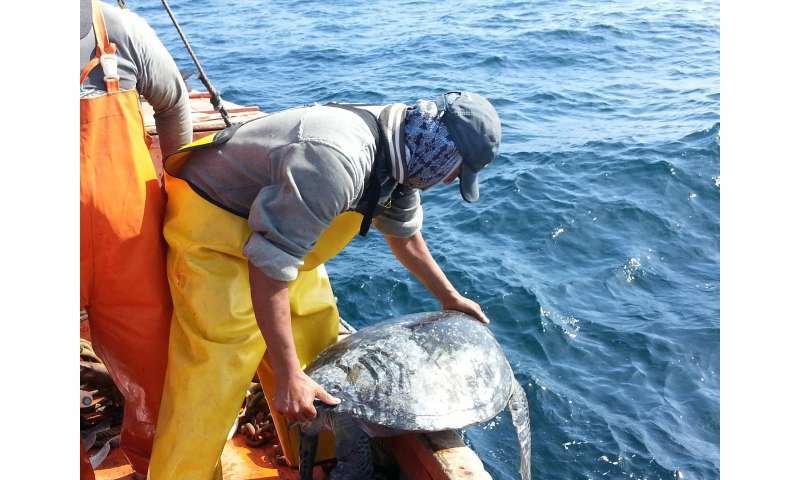 "We are actively working with fishers in this region to develop and implement solutions to bycatch—not just to improve the situation for turtles but for the health of fisheries and fish stocks. "Our goal is to develop fisheries that are sustainable for small-scale fishing communities and the species with which they interact." Dr. Jeffrey Mangel, also of the University of Exeter and ProDelphinus, added: "Gathering this survey data was a massive effort across three countries, and the results give us fascinating and important insights. "We are careful not to overstate threats to wildlife, but in this case it's clear that tens of thousands of turtles are being caught each year." The southeastern Pacific sustains extensive fisheries that are important sources of food and employment for millions of people. The paper, published in the journal Fisheries Research, is entitled: "Untangling the impacts of nets in the southeastern Pacific: Rapid assessment of marine turtle bycatch to set conservation priorities in small-scale fisheries."